Fujitsu Limited has announced the results of a field trial conducted with the assistance of the Maritime and Port Authority of Singapore (MPA) in analyzing marine traffic risks in the Singapore Strait. Fujitsu has demonstrated the usefulness of a novel ship collision risk prediction technology that leverages the power of Artificial Intelligence (AI) in predicting near misses between vessels. Using AI technology “Fujitsu Human Centric AI Zinrai” developed by Fujitsu Laboratories Ltd, this solution can detect ship collision risks and predict areas where collision risks are concentrated as dynamic risk hotspots. 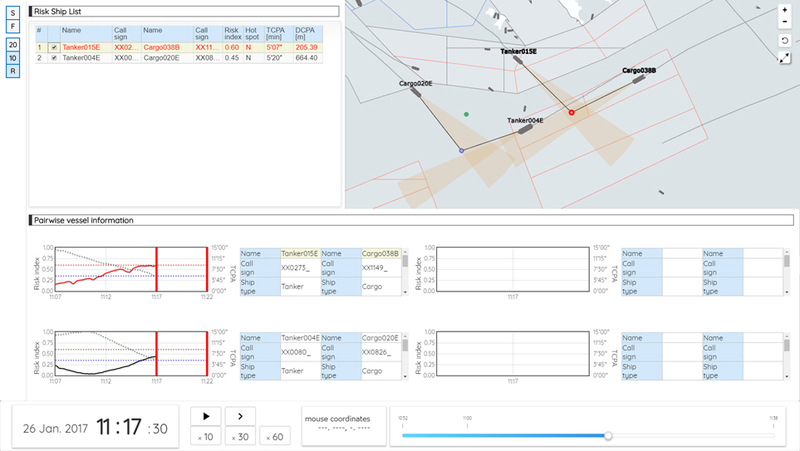 This technology has the potential to be deployed in a Vessel Traffic Service (VTS) system(1) to assist maritime traffic controllers to manage marine traffic proactively with the aim of improving the safety of navigation. Fujitsu aims to deliver services incorporating this technology for maritime traffic controllers and ship operators by 2020. Fujitsu will present the outcomes of this research at the IALA(2) e-Navigation Information Services and Communications (ENAV) 23rd Committee Meeting in Singapore from 1 to 5 April 2019, and also share this and other work on maritime safety, at Sea Asia 2019, from 9 to 11 April in Singapore. Fujitsu conducted its research and testing with the assistance of about 10 MPA officers from the Vessel Traffic Management Department and Port Systems Division over 24 months. Details of the testing and its results are as follows. 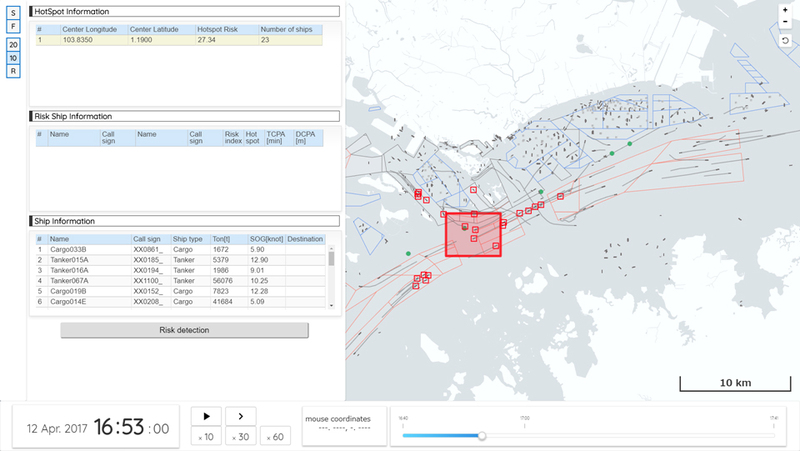 Drawing on past traffic data for the Singapore Strait provided by MPA, Fujitsu leveraged its collision risk prediction technology to extract information such as examples of collisions or near misses involving multiple vessels, as well as examples of developing dynamic risk hotspots. The prediction technology was benchmarked to human operators. Fujitsu’s risk detection technology demonstrated the possibility of quantifying risk in more detail in advance of the detection by human operators. For example, based on benchmarking studies, the detection technology was able to flag potential risks approximately 10 minutes before the near-miss, and in doing so, would theoretically provide approximately 5 minutes lead time for human operators to execute the necessary follow on action, e.g. through the provision of advice to the vessel(s). Fujitsu’s technology was also able to pick out scenarios where the collision risk could be overlooked and raise the alert to a possible collision incident. Separately, the dynamic risk hotspot detection technology could detect risks up to 15 minutes in advance, enabling staff to take specific measures to avoid an incident. Based on the results of this development, Fujitsu will continue working with Singapore to improve the technology, and deliver a solution supporting safe navigation for maritime traffic control and for ship operators by 2020. VTS System System used for the management of vessel traffic services. Used to provide essential information relating to shipping and maritime traffic, collecting relevant data in order to improvement the safety and efficiency of navigation. IALA International Association of Marine Aids to Navigation and Lighthouse Authorities. A non-governmental organization that contributes to furthering the development of navigation support systems through the enhancement of related technologies, exchanging information and materials about navigation support beacons and engaging in the standardization of navigation support systems, while maintaining close involvement with international maritime organizations.